Angus Fitchet was born in Dundee in 1910 and became one of Scotland's foremost fiddlers and Scottish Country Dance Bandleaders. He began playing at the tender age of five. Then, at the ripe old age of twelve, he stood-in for an absent violinist at a local cinema showing silent films and was soon making five shillings a week doing this. He wrote his first tune, the March, ‘Mr Michie’, at the age of 16 in 1926. In 1932 he married Matilda Speirs Rowan, but sadly this union was ended by divorce. The marriage certificate shows that his father’s job had been that of 'Scavenger', but it is known that he too had been an accomplished fiddler. His son in later life, clearly in memory of his father, composed and played a 'Two Step' called 'The Dancing Dustman'. Writing tunes in fond memory of his closest friends was a feature of his work .... and these rank among the loveliest of his compositions. In the late 1930s he went to Largs to join a five-piece orchestra in a restaurant there. He also played in the Winifred Bird Mathew Band in Dundee, and then later appeared with accordionist Will Starr. He joined Jimmy Shand’s Band in 1945 and this gave him a real taste for Scottish band work. So much so that in due course he formed his own highly successful Scottish Dance Band, and drove all over Britain in an old Dodge Red Cross ambulance run on half petrol, half paraffin (!) to play at dances large or small. During this time, his band also made many live wireless broadcasts and records. Eventually Angus returned to playing solo fiddle, and toured with Will Starr and Robert Wilson. He was renowned for his note-perfect sweet tone despite having a very modest fiddle. He was known to describe it as “an auld bit o' stick”. However, he did insist on a having an excellent bow. He was in his late sixties when he joined Jimmy Blue, whose band travelled full time with Andy Stewart. Andy loved Angus' humour and many a time "dried up" onstage because of Angus' witticisms. 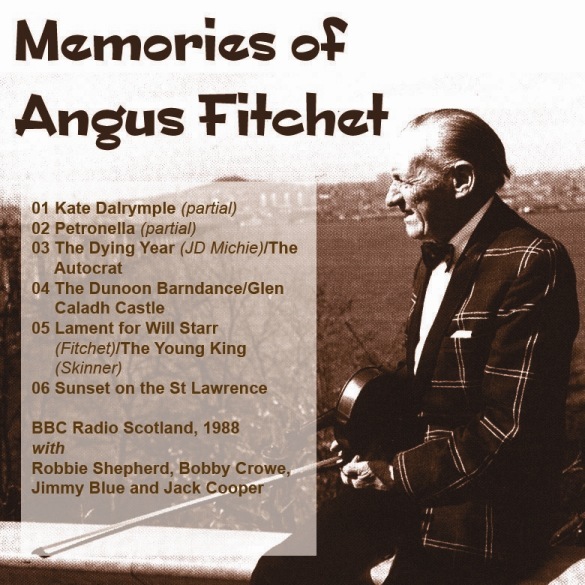 Andy indeed wrote a twenty-three verse poem in his honour entitled ‘On Angus Fitchet’. Although suffering from arthritis and deafness, he continued entertaining, and was often a guest with Bobby Crowe and his Band at venues all over Scotland and in the North of England. Amazingly, he was still performing in his early eighties, and even completed a broadcast for the BBC c.1991. His reel, "J.B. Milne", has probably been broadcast more than any other Scottish tune. When asked, not long before his death in 1998, how he would like to be remembered, Angus considered for a few moments, then replied: "Angus Fitchet, composer and fiddler." Wad dance the heilan' fling. And nod their grave respect. Dance out at his command. When Fitchet plays a reel? An wha' can keep frae beatin' time? An' stoun' the senses there. For joys will ne'er return. When Angus maks them speak. The yins he wrote himsel'. Ye've brocht your fiddle wi ye. This man ca'd Angus Fitchet.